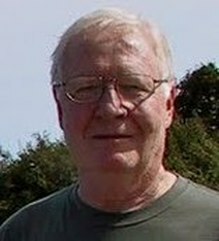 Ex-military, former teacher and non-fiction writer, Thomas Rowe Drinkard, joins us to discuss his current career as a Thriller/Mystery writer. TB: Tom, welcome to the “Author’s Dialogue” series. I am so excited to offer our readers an audio clip of your work! But before we get to that, could you please start by giving us a bit of background to your writing career? Such as, when and why did you decided to start writing? TD: Can’t pin that down. I wrote stories and poems in the sixth grade, for sure. TB: What have been your best and worst experiences as a writer? TD: Best is easy: receiving messages from people who couldn’t find a “stopping place” in my novel and read until 3 a.m. Worst: having agents lie to me about their intentions. Phony “love” at a writers’ conference should banish the offenders to a special level of purgatory, at least. TD: Ah, the agony and ecstasy. The good is so gratifying and the bad simply allows one to develop mental and emotional calluses. 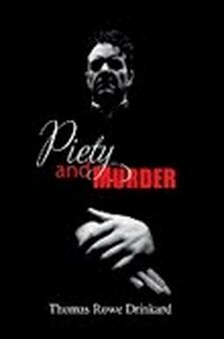 TD: My debut novel, Piety and Murder is available in digital form on a number of sites. Amazon and B&N are two. It is a book about a man who, while trying to protect his family from the depredations of a phony faith healer, falls afoul of violent criminals who use the televangelist as cover. It is a thriller, complete with running gunfights and hostage rescue. What a dynamic and complimentary overview of both you and your book! Now, for the benefit of our readers, here’s an audio clip by you and your wife, Marjorie Hatfield Drinkard, on Piety and Murder. Have you written a prequel or sequel to appease your readers? 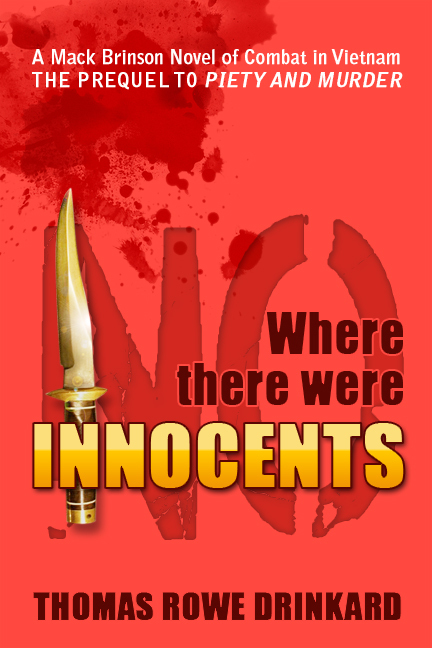 TD: The prequel, Where There Were No Innocents is in final editing and will be published soon. TD: For years I spent five to eight days in a suburb of New Orleans, Metairie. It was virtually impossible to turn on the TV in my hotel room without getting faith healers and televangelists’ programs. I began to guess that those organizations would make great cover for all sorts of nefarious activities. They probably don’t come under much official scrutiny. TB: Are you a “blank-pager,” or do you use outlines? TD: I work from a blank page-on the word processor. The scenes are constructed in my mind. I “see” them before writing. For me, outlining destroys the immediacy of writing. When I’ve tried to write from an outline, I felt as if I was doing one of the old paint-by-numbers oils. TD: The disclaimer will always say that the characters are products of my imagination. Some are just that. Others have recognized themselves, and there are composites. TD: The publishing world has changed and is changing. The artist, the author, now has much more control and is able to keep more of the profits for his or her work. To me, this is as it should be. TB: Is there a different genre you would like to try writing? TD: Yes, I actually have a science fiction novel and a paranormal novel as works-in-progress. Two completed, but unpublished books are my more familiar thriller/mystery books. TB: Can you tell us a bit about your next project? TD: My next project is to complete a book that can be mentioned as, “torn from today’s headlines.” It involves a new protagonist and several cold terrorists. I’m approaching the final showdown. Maybe another 40-50 pages. TB: Describe your ideal surroundings/conditions for writing. TD: My home, my office and silence or quiet music, often classical. TB: Have you ever co-authored a piece? TD: Not yet, although my wife is my first editor. She often makes good suggestions for changes. TD: Tell the story, as you’d want to hear it. Don’t take too many side-trips. If a passage doesn’t contribute to moving the narrative forward, delete it. Read works of good writers in your genre. Learn how they handle narrative, dialogue and story structure. TB: What are your quirks and do they influence your writing? TD: I have a tiny streak of perfectionism. I tend to edit too much while writing. I have to care about my characters, or they won’t come to life. I can become involved in their fictional lives. TB: Please share with us, a little-known fact about you which others might find interesting or entertaining. TD: My wife, Marge, and I bred and exhibited Bull Terriers for more than twenty years. We managed to produce homebred champions and traveled as far as Calgary, Canada for special shows. Our kennel name was Merlyn. We loved the dogs but eventually tired of the politics in the ring and clubs. TB: Tom, thanks so much for your lively responses! I wish you all the best with your future works. Tom is now a full-time writer/part-time freelance editor and author of Piety and Murder. This entry was posted in Interviews and tagged Interviews, Mystery, Thriller by Terre Britton. Bookmark the permalink. Wonderful interview, Thomas, and Terre. I’m constantly fascinated by the different ways various writers work. A very informative, and interesting post. Thanks Al. Terre did a great job. My wife, Marge, had the great idea of a female voice (hers) doing the intro blurbs on the audio. I agree with Al, a great interview. Congrats to Tom and Terre both! I particularly enjoyed the candor of some of Tom’s answers. It always makes a read more enjoyable to know something about the author. I couldn’t agree more with the previous comments. And the audio selection — powerful stuff! Good interview, Thomas and Terre. I could relate to your statement that you edit ‘while writing,’ I do that too. Sometimes a sentence won’t stay on the paper more than a few moments before I find a better way of saying it. I’d never thought of it as a quirk! Televangelists – what a great idea for the murder/thriller genre. I wish you and your editor wife well! Nice interview. Good luck with your books, Thomas. Excellent stuff…and I don’t say that because of my relation to the author. Enjoyed the interview very much. Congratulations to all. What a thrill to read all these wonderful comments. Thank you for being a part of Tom’s success on Author’s Dialogue! It’s been such an honor to be working with you,Tom; and I salute both you and Marge for pulling that audio together over the course of a day!